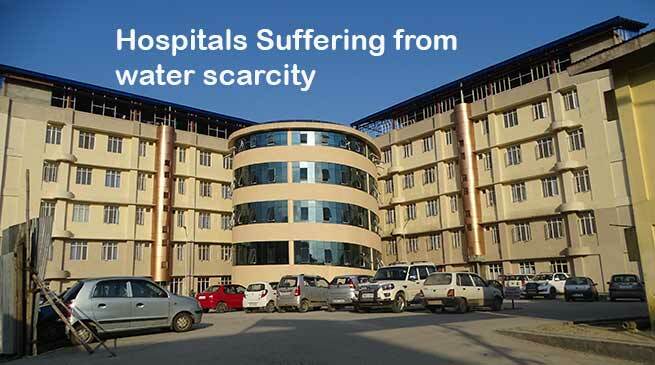 Hospitals in Itanagar and Nahrlagun are suffering from scarcity of water. The operation Theatre(OT) at RK Mission Hospital, Itanagar have close down due to scarcity of water while discarding patient for admission for last three days. The scarcity of water has hit the common man and jeopardise the health care system in state specially in twin capital city. The scarcity water after the severe landslide and flood the state on July 8 & 9 which have damaged many roads, bridge, dwelling houses and infrastructure as well as badly affected water supply system of state. All parts of state have been affected by heavy downpour which led to lost of life and property in different parts of state including that of 1 drowned in Pachin river at Naharlagun, another at Senki river at Itanagar while 14 died at Laptap in Toru circle and communication bottleneck after disruption of road, water supply system, electricity poles in different district. The most needed for survival is food and water besides others, the state capital is badly affected due to scarcity of water supply due to breakdown of pipelines and other infrastructure at various location in Itanagar and Naharlagun and other parts of the capital complex. Itanagar is facing scarcity of water supply due to breakdown of supply system near intake system at Poma where more than 200 mtrs of main pipeline have been completely washed away by Poma river and the river have diverted its course in other places while pipeline damaged at Niti Vihar, Mowb-II, Senki View and few other places and there is no water supply while at Naharlagun due to collapse of water supply handing bridge and at few other places near Yupia the water supply of Naharlagun and Nirjuli township have been completely halted and no water is being distributed through the pipeline of PHE department. The common people any how managing their day today affairs but the patients in hospital are severely affected. The most affected in capital complex are RK Mission Hospital at Itanagar and TRIMS at Naharlagun and patients are suffering allot and the condition of the patients are going day by day. When this scribe visited both hospital and find that the condition of the indoor patients are worse than before three days, they hardly go for nature calls and the condition of toilets ad bathroom are horrible, the wards are smelling due to non flushing of toilets and the hospital authority are handicapped as they have no system of water supply other than the pipeline of PHED water supply system since its inception and totally dependent of government system. When few patients complaining of not taking bath, even for nature calls frequently. While the nurse and doctors said that we are compelled to use the spirit instead of water after investigating of one patient to another as there is chances of infection from case to case. When contacted Secretary RK Mission Hospital Swami Visweshananda Maharaj said that we are extremely facing lots of problems and inconvenient in running the hospital due the scarcity of water, the rate of admission of been drastically reduced and we are also discouraging the patients for admission. We are in touch with PHED authority though they have provided some water which through tankers which is not at all sufficient and family members in colony are also facing the same situation and who are being distributed by the Tata mobile delivery system introduced by department. Maharaj said that we are arranging the labour room any how, the scarcity of water is really a severe problem and due to which we are planning for rain water harvesting next time. He appeal that the Hospital is a public place is an essential service which may be kept as a special case without interruption of water and electricity supply. TRIMS Medical Superintendent D. Raina said that we are also facing the same condition and the patient as well as medical staffs are affected due to scarcity of water supply system disruption. He said that there have been proposal of three deep bore well in the under construction campus and one borewell have been completed and we are trying to connected the bore well constructed by the hospital construction company Kenge Construction. He have directed to the company to connected the hospital water tank of the hospital from which the OT, emergency and labour room and hourly to the wards turn wise on temporary basis. PHE & Water Supply Parliamentary Secretary Kumsi Sidisow said that natural calamity have destroyed and damaged water supply system in many parts of state including in capital complex. The damaged is at intake point at Poma, Yupia, Doimukh, Kimin, Balijan, Sagalee including the pipeline in other parts of district and state have severely affected the water supply to the common public through PHED pipeline. Most affected are the capital complex is due to washed awaya of portion of intake point at Poma and collapse of bridge near Helipad and at Yupia and scarcity like situation have arise. We are aware of the problems and the department have pressed takners adn tatamobile for distribution of water to various colony and sector of capital complex at Itangar, Naharlagun and Nirjuli. We have deployed 9 tankers for Itanagar, 17 in Naharlagun and 1 in Nirjuli which are distribution since morning to evening at various location. The water supply to RK Mission and TRIMS will be done latest by tomorrow through 150 dia. He said that the Doimukh township is being arranged through alternate source while in Kimin, Doimukh, Balijan, Sagalee, Bhalukpong including capital complex is under restoration. He said that the man and machine including engineers, mechanice and technicial and pumbers are on job and restoration is on war fooring in various places of catial and state and hopeful the problems is resolved. He further appeal one and all citizens of capital complex to bear with the inconveniences and have patience.